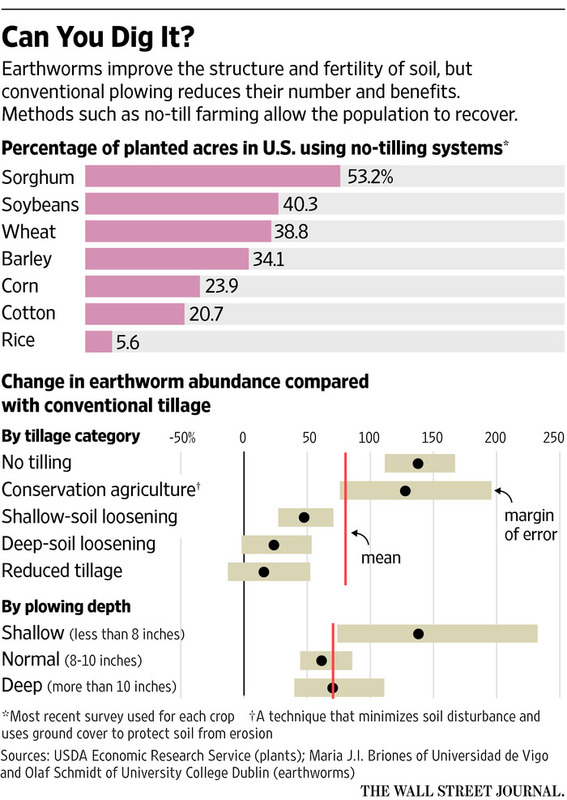 Earthworms are disappearing from our farm and range lands. Two articles on this topic appear below. #1: New York Times attributes this to plowing, but #2: Science shows glyphosate (Roundup) use associated with GMO’s and brush control is worse. #1: The Dirty Little Secrets Behind Earthworms: They benefit the soil, and farming techniques that minimize tillage are good for them. An unusual workforce labors beneath the surface of the world’s farms. It can turn over 8,000 pounds of earth on an acre of land in two weeks. Its tunnels aerate the soil, and its castings nourish it. Not bad for invertebrates the size of a string bean. They are earthworms, the industrious wigglers Charles Darwin once called nature’s plow. But farmers’ plows have been killing the tiny tillers for decades, leaving cropland less fertile and increasing the need for chemical nutrients. A new study confirms the impact of conventional plowing and evaluates the effects of alternative tilling methods. “Conventionally plowed soils reduce earthworm populations drastically, and this means that we get few of the good things that earthworms do for us,” said Maria J.I. Briones, an author of the study and a professor of soil zoology at Universidad de Vigo in Spain. arthworm populations can bounce back if conventional plowing is replaced with less disruptive methods, but there are trade-offs. Conventional tillage, which disrupts soil to a depth of 8 to 16 inches, provides crops with optimal conditions for germination and inhibits weeds, pests and disease. Conservation methods—such as no till or strip till that forgo plowing or limit it to shallow depths in targeted areas—reduce fuel and labor costs and the need for chemical fertilizers, but crop yields may shrink and the need for herbicides may increase. Earthworms improve the structure and fertility of soil by working organic material into the dirt, providing channels that make it easier for water and oxygen to penetrate it and converting nutrients into forms plants can readily absorb. When the population of the worms is diminished, the quality of the soil suffers. To gauge the extent of the problem, Dr. Briones and Olaf Schmidt, a professor in the school of agriculture and food science at University College in Dublin, reviewed 215 field studies from 40 countries dating back to 1950. Their research, published in the scientific journal Global Change Biology, found declining populations in fields that were plowed every year. Disturbing the soil less increased abundance up to 137%. 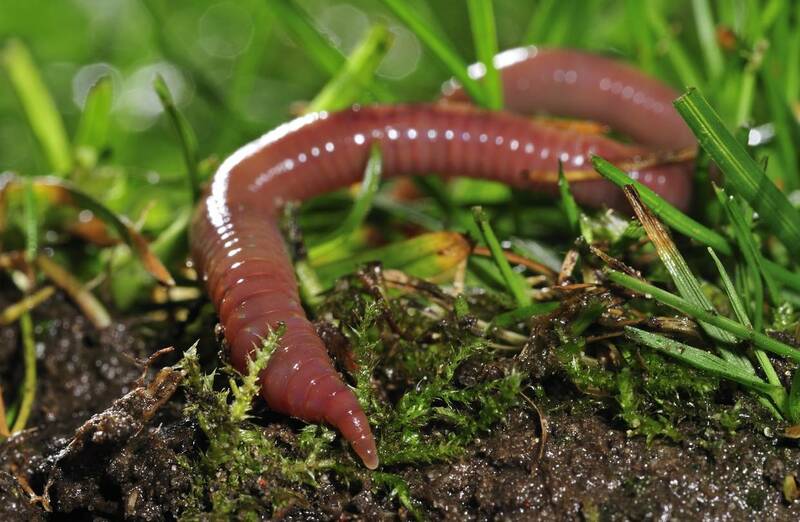 Conventional plowing kills earthworms through injury or by exposing them to predators, destroying their burrows and diminishing their food supply. “The more you till, the less they have to eat,” said Sharon Weyers, a soil scientist with the U.S. Department of Agriculture. A good earthworm population might number around 200 worms per square meter. An excellent population would have twice as many. Earthworm Watch, a collaboration of the Earthworm Society, London’s Natural History Museum and Earthwatch Institute, monitors earthworms and soil health in the U.K. There is no comparable survey in the U.S., but individual research projects assess earthworm populations. To count worms, researchers dig a pit around 1 cubic foot in size, then sift through the soil by hand, or they roust worms from the ground by sending electroshocks through the soil or by soaking it with a solution of hot mustard. Irritated earthworms surface, where they can be counted. It can take a decade or more for diminished populations to rebound, Drs. Briones and Schmidt found, with populations increasing the most when the soil is disturbed the least. No-till farming, which is used on about 34% of cropland in the U.S., according to USDA economist Steven Wallander, is the least disruptive. Although no-till farming is theoretically possible on most cropland, the cost of changing to specialized seeding equipment may be prohibitive for small farms, which populate much of the world. John Ledermann, a third-generation Minnesota farmer who raises corn, soybeans, wheat and cereal rye, has transitioned his 1,100 acres to no till and strip tilling. His yields have been mixed, he said, but he’s using about half the fuel and sees visible improvements to the soil. He recalled walking across a field at dusk one spring when he noticed movement on the ground. Herbicide use is increasing worldwide both in agriculture and private gardens. However, our knowledge of potential side-effects on non-target soil organisms, even on such eminent ones as earthworms, is still very scarce. In a greenhouse experiment, we assessed the impact of the most widely used glyphosate-based herbicide Roundup on two earthworm species with different feeding strategies. We demonstrate, that the surface casting activity of vertically burrowing earthworms (Lumbricus terrestris) almost ceased three weeks after herbicide application, while the activity of soil dwelling earthworms (Aporrectodea caliginosa) was not affected. Reproduction of the soil dwellers was reduced by 56% within three months after herbicide application. Herbicide application led to increased soil concentrations of nitrate by 1592% and phosphate by 127%, pointing to potential risks for nutrient leaching into streams, lakes, or groundwater aquifers. These sizeable herbicide-induced impacts on agroecosystems are particularly worrisome because these herbicides have been globally used for decades. During the past 50 years the human population has more than doubled, while the productive arable area has increased only by 10%1,2. As a consequence, the intensity of agricultural production has increased dramatically including the use of pesticides. Among pesticides, glyphosate-based herbicides are most widely used – hardly available data state a global usage of about 650,000 tons3 at sales worth about 6.5 billion US $ in 20104. Glyphosate-based herbicides have been so widely used because they are very effective, acting non-selectively on plants by inhibiting the shikimic acid metabolic pathway found exclusively in plants and some microorganisms5. Hence, animals should theoretically not be affected by the application of glyphosate. Moreover, glyphosate is considered environmentally friendly due to its fast degradation5 and strong adsorption to soil particles that should reduce leaching losses from the soil profile6. Nevertheless, evidence that glyphosate-based herbicides can harm non-target organisms, particularly amphibians7,8, symbiotic mycorrhizal fungi or earthworms continues to mount9,10. Earthworms constitute a majority of soil faunal biomass in many temperate agroecosystems, with up to 1000 individuals and 300 g of biomass in each square meter of land11. They act as ecosystem engineers12 by physically shredding plant litter, mineralizing it in their guts (along with soil organic matter), and enhancing soil nutrient availability through the production of up to 40 tons of casts per hectare annually13 that can promote plant productivity14,15,16. Earthworm burrowing also enhances soil root penetration and water infiltration by constructing up to 8900 km of belowground channels per hectare17. Thus, earthworms strongly modulate agroecosystem function and services and any factor that may harm earthworms will impact ecosystem function, including plant growth and productivity14,18,19. Most studies that have examined the effects of glyphosate-based herbicides on the activity and reproduction of temperate earthworms have been conducted under laboratory conditions using compost worms (Eisenia species) that commonly do not inhabit agroecosystems20,21,22,23,24,25. Here, we present results of a greenhouse experiment testing the effects of a glyphosate-based herbicide on two earthworm species that are indeed frequently found in agroecosystems: the vertically burrowing anecic earthworm Lumbricus terrestris L. and the soil-dwelling endogeic species Aporrectodea caliginosa Savigny. We hypothesized that herbicide application would stimulate earthworm activity and reproduction due to the increased availability of dead plant material that earthworms can use as food source. As a knock-on effect, we expected that herbicide application via its effects on earthworms would also alter water infiltration, soil nutrient availability, and decomposition. To test these hypotheses, we established weed communities comprising of a grass, a leguminous herb and a non-leguminous herb species commonly occurring in arable agroecosystems or garden beds. To these weed communities we added vertically burrowing or horizontally burrowing earthworm species. Eight weeks after planting, the vegetation in half of the mesocosms was treated with a lower-than-recommended dose of glyphosate-based herbicide. Herbicide application initially stimulated surface casting activity of L. terrestris, however the number of produced casts ceased dramatically about one week after herbicide application; in contrast the surface casting activity of this species remained nearly constant when no herbicide was applied (Fig. 1A). Not only did exposure to herbicide reduce the number of surface casts produced, it also reduced the mean mass of individual casts (546 ± 202 mg cast−1 vs. 1,408 ± 140 mg cast−1). Compared to non-herbicide treated mesocosms, cumulative cast mass produced by L. terrestris four weeks after herbicide application was reduced by 46% compared to untreated mesocosms (560 g m−2 vs. 1,032 g m−2; P < 0.001; Fig. 1B). Surface casting activity and cast mass production of the soil-dwelling earthworm species, A. caliginosa, was not affected by herbicide application (Fig. 2A,B). Monitoring surface casting activity has recently been proposed as an ecotoxicity test better related to earthworms’ ecological role than standard laboratory tests26. Although the studied earthworm species differ in their feeding behavior, both have been shown to cast on the soil surface when foraging for leaf litter and other organic material27,28. The peak in surface casting activity observed after herbicide application was therefore likely the consequence of an increased availability of dead leaf material. Since we provided extra food for earthworms in all treatments (i.e., dried chopped hay spread over the soil surface) which is supposed to increase surface casting activity, the further decrease in casting activity in herbicide-treated mesocosms clearly demonstrates a direct impact of the herbicide. These detrimental effects of the herbicide on earthworm activity are also surprising as soil moisture increased between 3% to 39% after herbicide application (Fig. 1C) reflecting the lack of physiologically active, transpiring plants – however, increased soil moisture commonly stimulates casting activity13,29,30. Another explanation for the reduced surface casting activity after herbicide treatment might also be that L. terrestris avoided plant residues contaminated with glyphosate on the surface. As a consequence these earthworms might have lived in deeper soil horizons and avoided surface foraging and casting. This might also suggest the – albeit not significant – higher water infiltration in mesocosms with this species when exposed to the herbicides (see below). Overall, at the end of the experiment we retrieved 93.3 ± 6.6% and 86.7 ± 9.9% of introduced numbers of L. terrestris and 100.0 ± 0.1% and 100.0 ± 2.6% of introduced numbers of A. caliginosa in –H and +H treatments, respectively. Figure 1: Activity of vertically burrowing earthworms before and after the herbicide application (-H, without herbicide; +H, with herbicide). (A) Daily surface cast production, (B) cumulative cast production over the course of the experiment, (C) time course of soil temperature (temp) and soil moisture (moist) (N = 6, mean ± SE). Red band marks period of herbicide application. P-values from two-sample Wilcoxon tests performed for the pre- and post-herbicide periods. Figure 2: Activity of horizontally burrowing earthworms before and after the herbicide application (−H, without herbicide; +H, with herbicide). (A) Daily surface cast production, (B) cumulative cast production over the course of the experiment (N = 6, mean ± SE). Red band marks the period when herbicide was applied. P-values from two-sample Wilcoxon tests performed for the pre- and post-herbicide periods. Reproduction success of both earthworm species substantially decreased after herbicide application. In total we found 25 cocoons from L. terrestris (18 cocoons in two –H, 7 cocoons in one +H mesocosm) and 292 cocoons from A. caliginosa (193 cocoons in six –H, 99 cocoons in six +H mesocosms). Hatching rate, i.e., percentage of cocoons from which earthworms hatched, decreased from 43% to 17% for L. terrestris (no statistical test was performed because of two few replications among treatments) and from 71% to 32% for A. caliginosa (P < 0.001) when cocoons were collected in mesocosms without herbicide or with herbicide treatment, respectively (Fig. 3). In ecotoxicological trials in the laboratory without plants glyphosate herbicide has also been shown to decrease the growth of A. caliginosa31,32 and reproductive output of compost worms (E. andrei and E. fetida)21,22. However, to our knowledge, the current data are the first to demonstrate in a near-realistic setting side effects of glyphosate-based herbicides on the surface casting activity and reproduction of earthworm species that actually inhabit agroecosystems and will consequently come in contact with these pesticides. Figure 3: Percentage of cocoons with hatchlings of a vertically burrowing (L. terrestris, Lt) or a soil dwelling earthworm species (A. caliginosa, Ac) collected from mesocosms without (−H) and with (+H) herbicide application. (Lt: N = 1–2, Ac: N = 6, mean ± SE). Inset shows a cocoon with a freshly hatched L. terrestris. Parameters indicating important ecosystems services were also affected by herbicide treatment. After herbicide application, all plants in our mesocosms were killed within a couple of days. As a consequence plant available nitrate in the soil increased by 1592% and plant available phosphate by 127% (Fig. 4A,B), probably attributable to a decrease in nitrate and phosphate uptake by plants33. While, no effect of glyphosate herbicides on soil decomposition rate was found, as in previous studies21, the herbicide application tended to increase the stabilization factor of litter in soil suggesting a conversion from labile into more recalcitrant compounds (Fig. 4C; 26). Herbicide application had no immediate effect on water infiltration after a simulated heavy rainfall event of 40 l m−2 (Fig. 4D). This was surprising as particularly vertically burrowing earthworms species such as L. terrestris are known to facilitate water infiltration14,34. However, the soil dwelling A. caliginosathat were less affected by herbicides in our study increased water infiltration (Fig. 4D, Table 1). These soil dwelling earthworms create short disconnected burrows with small diameters35 and have also been found to increase water infiltration rates in other studies14,36. Figure 4: Soil parameters affected by herbicide application (–H, without herbicide; +H, with herbicide application) in response to the presence of different earthworms (NoEw, no earthworms; Lt, L. terrestris; Ac, A. caliginosa). (A) Plant available nitrate (NO3−), (B) plant available phosphate (PO43−), (C) soil stabilisation factor, and (D) water infiltration rate. (N = 6, mean ± SE). Table 1: Summary of two-way ANOVA results testing the effects of herbicide application and earthworms on plant available nitrate (NO3−) and phosphate (PO43−), decomposition rate (k), stabilization factor (S), and water infiltration rate. Because earthworms play a pivotal role in co-determining how agro- and garden ecosystems function, the observed deleterious side effects of glyphosate-based herbicide application indicate far-reaching consequences of its use in ecosystems. First, the role of earthworms as important ecological engineers in agroecosystems and gardens can be compromised10. Reductions in mixing of organic litter within the soil will limit long-term soil microbial activity9, effects of earthworms on aboveground herbivores37,38,39, soil nutrient cycling and availability, all of which may lead to reductions in plant productivity40. Second, pulses of nitrate and phosphate availability following herbicide application could increase the risk of leaching or surface runoff of these nutrients into groundwater systems or adjacent aquatic ecosystems, as long as the crop cover is not yet re-established. Obviously, official testing of potential side-effects during registration procedures failed to identify these ecologically important impacts41. Although productivity in many agricultural systems depends on the use of pesticides, findings from our study strongly indicate that more serious attention has to be paid testing pesticides for potential undesirable ecological side effects, especially in light of the projected doubling of global pesticide use by 20502. The experiment was performed between March and July 2013 in a greenhouse at the University of Natural Resources and Life Sciences Vienna (BOKU), Austria. We used 36 plastic pots (volume: 45 l, diameter: 42 cm, depth: 39 cm) filled with a 70 : 30 (vol/vol) mixture of soil from an arable field (soil type: Haplic Chernozem; BOKU Experimental Farm Groß-Enzersdorf) and quartz sand (grain size 1.4–2.2 mm) to create mesocosms. The substrate was homogenized using a concrete mixer, sieved (10 mm mesh size) and filled into the pots at a bulk density of 1.3 g cm−3. The chosen mesh size might not completely retain juvenile earthworms or cocoons already present in the field soil; however because of the thorough mixing and random distribution of the substrate among the experimental pots homogeneity across treatments can be assumed. The substrate had the following characteristics: total C = 4.41 ± 0.06 mg g−1, total N = 0.16 ± 0.01 mg g−1 (C:N ratio 27.6), K = 3.18 ± 0.12 mg g−1, P = 0.62 ± 0.04 mg g−1, and pH (CaCl2) = 7.45 ± 0.02 (mean ± SE). To provide an initial food source for the endogeic earthworms (see below), 1.5 g dry mass of shredded grassland hay l−1 soil was added to all mesocosms. The mesocosms were planted with three types of plant species: the grass Dactylis glomerata L., the leguminous herb Trifolium repens L., and the non-leguminous herb Taraxacum officinale F.H.Wigg. The three species are common weeds on agricultural fields (e.g. arable land, vineyards) across Central Europe. Plants were germinated from seeds obtained from a commercial supplier specialized in wild plant populations (Rieger-Hofmann GmbH, Blaufelden-Rabholdhausen, Germany). When seedlings were 1 cm high, 17 seedlings per species were transplanted to the pots in a triangular pattern (5.5 cm between plant individuals; plant density: 51 plants mesocosms−1). During the experimental period, each mesocosm was irrigated equally using an automatic sprinkler system; mesocosms were placed on slats, allowing for free drainage. Three weeks after planting, three earthworm treatments (n = 12) were established. The thirty-six mesocosms either received five specimens of adult vertically burrowing (anecic) Lumbricus terrestris L. (Lt) mesocosm−1 (25.5 ± 0.7 g mesocosm−1; ~183 g m−2), ten adult/sub-adult specimens of the horizontally burrowing (endogeic) Aporrectodea caliginosa Savigny (Ac) mesocosm−1 (12.09 ± 0.30 g mesocosm−1; ~87 g m−2), or no earthworms (NoEw). All earthworms were carefully rinsed, dried with filter paper and weighed before insertion; earthworm stockings for L. terrestris are in the upper range of natural abundance in temperate arable fields42. A. caliginosa was hand-collected from garden soil by one coauthor (JGZ) near the city of Eisenstadt (Burgenland, Austria), L. terrestris was purchased in a fishermen bait shop in Vienna. Earthworms were stored in boxes filled with the soil mixture for 5 days before transferred into mesocosms. All earthworms appeared to be in good health and buried themselves into the soil within a few minutes. Two times during the experiment 7.0 g of shredded hay were applied on the soil surface of each mesocosm, providing an additional food source. In order to prevent earthworms from escaping the mesocosm, drainage holes at the bottom of all pots were covered with garden weed fleece and the upper rim of all pots was extended with a 20 cm high, slightly outward bending barrier of transparent plastic film brushed with soft soap39. Eight weeks after planting, mature plants (D. glomerata was about 40 cm high, T. repens 19 cm, T. officinale 31 cm) of half of the mesocosms were treated with the herbicide ‘Roundup®’ (treatment +H), whereas the other half of the mesocosms remained untreated (treatment –H). Each +H mesocosm was sprayed with 7.2 ml of ‘Roundup® Alphée’ (glyphosate concentration 7.2 g l−1; Scotts Celaflor, Mainz, Germany) on two consecutive days (in sum 14.4 ml), and 10 ml of ‘Roundup® Speed’ (glyphosate concentration 7.2 g l−1; Scotts Celaflor, Mainz, Germany) two days afterwards. In total for all applications, 176.12 ml m−2 of herbicide was applied which is 53% lower than the recommended plant-based application rate of 1000 plants l−1 for ‘Roundup® Speed’ and 62% lower than the recommended dose of 800 plants l−1 for ‘Roundup®Alphée’ (Monsanto Co., St. Louis/Missouri, USA). The manufacturer recommends both herbicides to be used as an areal application prior to planting new lawns or garden beds, however it is unclear how often these products are actually applied together. Both products are sold in ready-to-use spray bottles – according to the manual we sprayed the products homogeneously to wet all weed leaves. The manufacturer suggests repeated treatments especially for perennial weeds (www.monsanto.com). The treatments were replicated six times in a full-factorial design: three earthworm treatments (no earthworms, Lt, Ac) and two herbicide treatments (−H, +H). To encounter influences from microclimatic gradients, the mesocosms were placed in a randomized complete block design. Soil moisture in the upper 30 cm of each mesocosm was monitored using a TDR system (6050 × 1 Trase System I; Soil moisture Equipment Corp., Santa Barbara, CA, USA); soil temperature in each mesocosm was measured at 10 cm depth (Digital thermometer az-8851; Guangzhou Orimay Electronic Co, Guangzhou, China). Air temperature and relative humidity were monitored using tinytags (Gemini Data Loggers, West Sussex, UK) at 1.5 m above the floor. Environmental conditions during the experiment: daily air temperature 22.6 ± 2.3 °C, relative humidity 58.6 ± 5.8%, soil temperature 20.2 ± 1.2 °C, and soil moisture 18.1 ± 2.6 vol% (means ± SE). The measurement of earthworm activity started ten days after the introduction of earthworms by collecting freshly produced casts on the soil surface in the morning. Surface casts were collected 20 times before, three times during, and 20 times after the herbicide application; each time the casts were counted, collected, dried (50 °C, 48 h) and weighed. Cast production was expressed as number of casts produced m−2 day−1. The water infiltration rate (l m−2 s−1) was measured two weeks after the final herbicide application by simulating a heavy rain shower of about 40 l m−2 (5.5 l mesocosm−1)14. The time from pouring the water onto the soil surface until the last visible water disappeared into the soil was recorded. Plant-available nutrients in the soil were measured using ion exchange resin bags (Amberlite IRN-150; Alfa Aesar, Karlsruhe, Germany;43). The resin bags (7 × 7 cm nylon mesh bags, 50 μm mesh width, containing 4.5 g resin) were stored in 2 M KCl and were rinsed in deionized water. Five days prior to herbicide application one resin bag was installed per mesocosm at 10 cm depth. Excavation took place 30 days after the last herbicide application to prevent resin saturation in the rather nutrient rich soil. Collected bags were quickly rinsed in deionized water to remove adhering soil and kept refrigerated until further analysis. The solution was analyzed for NH₄+ and NO3¯ using a xMark Microplate Absorbance Spectrophotometer (BIO-RAD, Philadelphia, PA, USA) and PO₄3¯ using an EnSpire Multimode Plate Reader (Perkin Elmer, Walthalm, MA, USA;44). Plant available NH4+ was below detection limit and was therefore not reported. Decomposition rate in the soil was determined using the Tea Bag Index (TBI,45). Therefore, two plastic tea bags containing either green tea (Lipton Unilever, USA: EAN 87 22700 05552 5) or Rooibos tea (Lipton: EAN 87 22700 18843 8) were buried at 10 cm depth in each mesocosm. Tea bags were removed 70 days after insertion (30 days after the last herbicide application). For calculating the TBI, consisting of the two parameters k (decomposition rate) and S (stabilization factor), the recommended calculated hydrolysable fractions (H; 0.842 g g−1 for green tea; 0.552 g g−1 for rooibos tea) were used45. During decomposition, parts of the labile compounds stabilize and become recalcitrant46. This stabilization depends on environmental factors47 and results in a deviation of the actual decomposed fraction (i.e. limit value) from the hydrolysable (i.e. chemically labile) fraction. Stabilisation factor S is this deviation is interpreted as the inhibiting effect of environmental conditions on the decomposition of the labile fraction45. Destructive harvest of the mesocosms took place 32 days after the last herbicide application. Mesocosms were flipped over on a 2 × 2 mm mesh screen. In addition, a total number of 292 cocoons of A. caliginosa and totally 25 cocoons of L. terrestris were collected during the harvest. They were stored separated by treatment in plastic boxes (26 × 16.5 × 12 cm, length × width × depth, respectively) and mixed into the soil substrate used for the main experiment and kept in a dark basement (mean temperature 15 °C, >70% relative humidity). After 15 weeks, the number of hatched earthworms was counted and the hatchling ratio per treatment was calculated. Residuals of all variables were tested for homogeneity of variances and normality using the tests after Levene and Shapiro-Wilk, respectively. Assumption for normality were not fulfilled by earthworm surface casting activity and associated soil temperature and moisture. Treatment effects for parameters not fulfilling the assumption for parametric tests were analyzed using the two-sample Wilcoxon test. Effects on decomposition, soil nutrients and water infiltration rate were measured either by one-way or two-way analysis of variance (ANOVA). Each significant ANOVA result (P < 0.05) was followed by Pairwise t tests as post-hoc comparisons with sequential Bonferroni corrections to account for differences in herbicide effects within earthworm treatments. All statistical analyses were performed using R (version 3.0.1; The R Foundation for Statistical Computing; http://www.R-project.org). Values given throughout the text are means ± SE. How to cite this article: Gaupp-Berghausen, M. et al. Glyphosate-based herbicides reduce the activity and reproduction of earthworms and lead to increased soil nutrient concentrations. Sci. Rep. 5, 12886; doi: 10.1038/srep12886 (2015). Tilman, D. et al. Forecasting agriculturally driven global environmental change . Science 292, 281–284 (2001). Woodburn, A. T. Glyphosate: production, pricing and use worldwide . Pest. Manag. Sci. 56, 309–312 (2000). CCM, I. L. Outlook for China Glyphosate Industry 2012–2016. (2012). Franz, J. E., Mao, M. K. & Sikorski, J. A. Glyphosate: A Unique Global Herbicide Vol. Monograph. 189 (American Chemical Society, 1997). Vereecken, H. Mobility and leaching of glyphosate: a review . Pest. Manag. Sci. 61, 1139–1151 (2005). Relyea, R. A. The lethal impacts of Roundup and predatory stress on six species of North American Tadpoles . Arch. Environm. Contam. Toxicol. 48, 351–357 (2005). Brühl, C. A., Schmidt, T., Pieper, S. & Alscher, A. Terrestrial pesticide exposure of amphibians: An underestimated cause of global decline? Sci. Rep. 3, 1135, 10.1038/srep01135 (2013). Zaller, J. G., Heigl, F., Ruess, L. & Grabmaier, A. Glyphosate herbicide affects belowground interactions between earthworms and symbiotic mycorrhizal fungi in a model ecosystem . Sci. Rep. 4, 5634, 10.1038/srep05634 (2014). Pelosi, C. et al. Reduction of pesticide use can increase earthworm populations in wheat crops in a European temperate region . Agric Ecosyst Environ 181, 223–230, http://dx.doi.org/10.1016/j.agee.2013.10.003 (2013). Edwards, C. A. & Bohlen, P. J. Biology and ecology of earthworms. 3rd edn, (Chapman & Hall, 1996). Jones, C. G., Lawton, J. H. & Shachak, M. Organisms as ecosystem engineers . Oikos 69, 373–386 (1994). Zaller, J. G. & Arnone, J. A. Activity of surface-casting earthworms in a calcareous grassland under elevated atmospheric CO2 . Oecologia 111, 249–254 (1997). Zaller, J. G. et al. Earthworm-mycorrhiza interactions can affect the diversity, structure and functioning of establishing model grassland communities . PLOS ONE 6, e29293 (2011). van Groenigen, J. W. et al. Earthworms increase plant production: a meta-analysis . Sci. Rep. 4, 6365, 10.1038/srep06365 (2014). Scheu, S. Effects of earthworms on plant growth: patterns and perspectives . Pedobiologia 47, 846–856 (2003). Kretzschmar, A. Descriptin des galeries de vers de terre et variations saisonnières des réseaux (observations en conditions naturelles) . Rev. Ecol. Biol. Sol. 19, 579–591 (1982). Bardgett, R. D. & Wardle, D. A. Aboveground-belowground linkages. Biotic interactions, ecosystem processes, and global change. (Oxford University Press, 2010). Blouin, M. et al. A review of earthworm impact on soil function and ecosystem services . European Journal of Soil Science 64, 161–182, 10.1111/ejss.12025 (2013). Verrell, P. & Van Buskirk, E. As the worm turns: Eisenia fetidaavoids soil contaminated by a glyphosate-based herbicide . Bull. Environm. Contamin. Toxicol. 72, 219–224 (2004). Casabé, N.et al. Ecotoxicological assessment of the effects of glyphosate and chlorpyrifos in an Argentine soya field . J. Soils Sediments 8, 1–8 (2007). Yasmin, S. & D’Souza, D. Effect of pesticides on the reproductive output of Eisenia fetida . Bull. Environm. Contamin. Toxicol. 79, 529–532 (2007). Correia, F. V. & Moreira, J. C. Effects of glyphosate and 2,4-D on earthworms (Eisenia foetida) in laboratory tests . Bull. Environm. Contamin. Toxicol. 85, 264–268 (2010). Buch, A. C., Brown, G. G., Niva, C. C., Sautter, K. D. & Sousa, J. P. Toxicity of three pesticides commonly used in Brazil to Pontoscolex corethrurus (Müller, 1857) and Eisenia andrei (Bouché, 1972) . Appl. Soil Ecol. 69, 32–38 (2013). Piola, L. et al. Comparative toxicity of two glyphosate-based formulations to Eisenia andrei under laboratory conditions . Chemosphere 91, 545–551 (2013). Capowiez, Y. et al. Earthworm cast production as a new behavioural biomarker for toxicity testing . Environm. Poll. 158, 388–393 (2010). Zaller, J. G. et al. Subsurface earthworm casts can be important soil microsites specifically influencing the growth of grassland plants . Biol. Fertil. Soils 49, 1097–1107 (2013). Curry, J. P. & Schmidt, O. The feeding ecology of earthworms – A review . Pedobiologia 50, 463–477 (2007). Zaller, J. G. & Arnone, J. A. Earthworm and soil moisture effects on the productivity and structure of grassland communities . Soil Biol. Biochem. 31, 517–523 (1999). Arnone, J. A. & Zaller, J. G. Earthworm effects on native grassland root system dynamics under natural and increased rainfall . Frontiers in Plant Science 5, 152, 10.3389/fpls.2014.00152 (2014). Springett, J. A. & Gray, J. A. Effect of repeated low doses of biocides on the earthworm Aporrectodea caliginosa in laboratory culture . Soil Biol. Biochem. 24, 1739–1744 (1992). Mohamed, A. I., Nair, G. A., Kassem, H. H. & Nuruzzaman, M. Impacts of pesticides on the survival and body mass of the earthworm Aporrectodea caliginosa (Annelida: Oligochaeta) . Acta Zoologica Fennica 196, 344–347 (1995). Hagan, D. L., Jose, S., Bohn, K. & Escobedo, F. Cogongrass (Imperata cylindrica) invasion and eradication: implications for soil nutrient dynamics in a longleaf pine sandhill ecosystem . Invasive Plant Sci. Managem. 6, 433–443 (2013). Fischer, C. et al. How Do Earthworms, Soil Texture and Plant Composition Affect Infiltration along an Experimental Plant Diversity Gradient in Grassland? PLoS ONE 9, e98987, 10.1371/journal.pone.0098987 (2014). Bastardie, F., Capowiez, Y. & Cluzeau, D. 3D characterisation of earthworm burrow systems in natural soil cores collected from a 12-year-old pasture . Appl. Soil Ecol. 30, 34–46 (2005). Ernst, G., Felten, D., Vohland, M. & Emmerling, C. Impact of ecologically different earthworm species on soil water characteristics . Europ. J. Soil Biol. 45, 207–213 (2009). Trouvé, R., Drapela, T., Frank, T., Hadacek, F. & Zaller, J. G. Herbivory of an invasive slug in a model grassland community can be affected by earthworms and mycorrhizal fungi . Biol. Fertil. Soils 50, 13–23, 10.1007/s00374-013-0827-1 (2014). Wurst, S. Effects of earthworms on above- and belowground herbivores . Appl. Soil Ecol. 45, 123–130 (2010). Zaller, J. G. et al. Herbivory of an invasive slug is affected by earthworms and the composition of plant communities . BMC Ecol. 13, 20 (2013). Arnone, J. A., Zaller, J. G., Hofer, G., Schmid, B. & Körner, C. Loss of plant biodiversity eliminates stimulatory effect of elevated CO2on earthworm casting activity in grasslands Oecologia 171, 613–622 (2013). Pelosi, C., Barot, S., Capowiez, Y., Hedde, M. & Vandenbulcke, F. Pesticides and earthworms. A review . Agron. Sustain. Developm. 34, 199–228 (2014). Pfiffner, L. & Luka, H. Earthworm populations in two low-input cereal farming systems . Appl. Soil Ecol. 37, 184–191 (2007). Binkley, D. & Matson, P. Ion exchange resin bag method for assessing forest soil nitrogen availability . Soil Sci. Soc. Am. J. 47, 1050–1052 (1983). Schinner, F., Öhlinger, R., Kandeler, E. & Margesin, R. (Springer Verlag, Berlin, 1996). Keuskamp, J. A., Dingemans, B. J. J., Lehtinen, T., Sarneel, J. M. & Hefting, M. M. Tea Bag Index: a novel approach to collect uniform decomposition data across ecosystems . Methods Ecol. Evol. 4, 1070–1075 (2013). Prescott, C. E. Litter decomposition: what controls it and how can we alter it to sequester more carbon in forest soils? Biogeochemistry 101, 133–149 (2010). Berg, B. & Meentemeyer, V. Litter quality in a north European transect versus carbon storage potential . Plant Soil 242, 83–92 (2002). We are grateful to Hans Göransson, Marcel Hirsch and Frauke Neumann for their help in the laboratory; to Karl Refenner for providing the field soil; to Edith Gruber, Adrián Laín Pérez, Peio Arteche Artabe and Marta Galàn Minaya for their help during the measurements and the harvest; to Daniel Koffler of the BOKU Institute for Applied Statistics for statistical advice and to Yoko Muraoka for help with the graphics. Comments by John A. Arnone III and Florian Heigl improved earlier versions of the manuscript. M.G.B., B.R. and J.G.Z. conceived and planned the experiment; all authors jointly performed the experiment, analyzed the data and wrote the manuscript. Correspondence to Johann G. Zaller.